When you walk through the streets of Oman’s vibrant capital, Muscat, it’s hard to believe that the country’s Ministry of Tourism was only established in 2004. Even more difficult to comprehend is that 34 years before that, the nation had only three schools, two hospitals and 10km of paved road. Oman’s transformation from one of the poorest nations in the Middle East to one of the most accessible is nothing short of astounding. The man behind this impressive feat is ruler Sultan Qaboos and you’ll see his revered image in practically every shop and restaurant in the city. 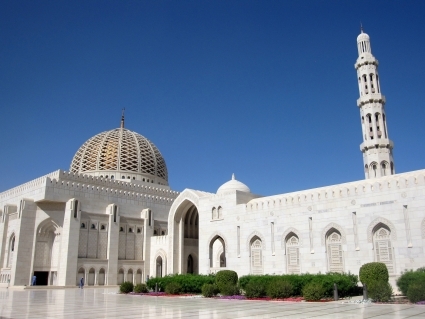 Today, Muscat is a lively city with a wealth of cultural attractions including old forts, palaces and traditional souks alongside some stunning newer developments such as the Grand Mosque. English is spoken widely, you can get a decent meal for about $10 and a can of Coke for 50c. It’s 6am and I’ve just dragged myself out of a warm, comfortable bed and up a near-vertical 100-metre wall of sand to watch the sunrise. You’ll rarely find me awake at 6am, let alone up, but this seems an appropriately intrepid way to start a day in which I’ll be following in the footsteps of one of the 20th century’s greatest explorers, Sir Wilfred Thesiger. The Oxford-educated Thesiger eschewed life in suburban England, spending much of his life exploring Africa and the Middle East instead. 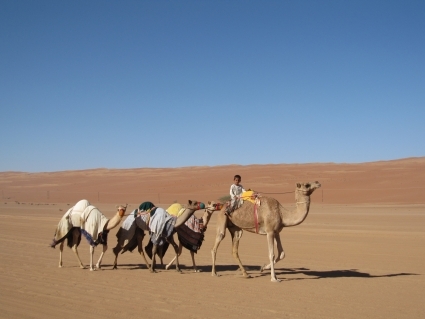 He is famous for two crossings, in the 1940s, of a vast expanse of desert known as the Empty Quarter. Notable as the world’s largest uninterrupted body of sand, this inhospitable wilderness dominates much of the Arabian Peninsula, extending from Saudi Arabia into the United Arab Emirates, Yemen and Oman. The journey I will undertake is not quite so ambitious. I will cross a much smaller desert in eastern Oman, called Wahiba Sands, which Thesiger visited in 1949. Despite the fact he did it by camel and I’ll be in an airconditioned four-wheel-drive, I can’t help but feel a certain comradeship with the explorer as I sit on the cool sand and watch the sunlight slowly flood the towering dunes. Thesiger endured unimaginable hardships on his travels and, as a tribute, I have decided to forgo my normal morning cup of tea.